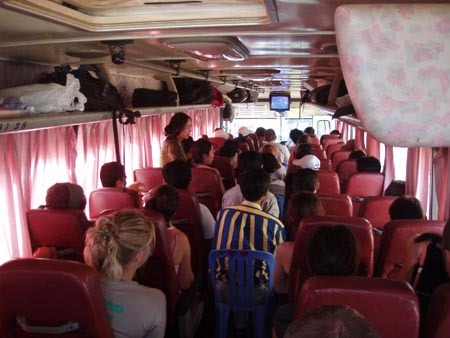 On the 13th, we caught a bus from Siem Reap to Phnom Penh, the capital of Cambodia rated in 2005 as the 6th worst city in the world in which to live (info here). Well, at least it’s a slight improvement on being 5th worst in 2004! The bus ride was full enough, so they brought flimsy plastic lawn chairs to have people sit in the aisle. 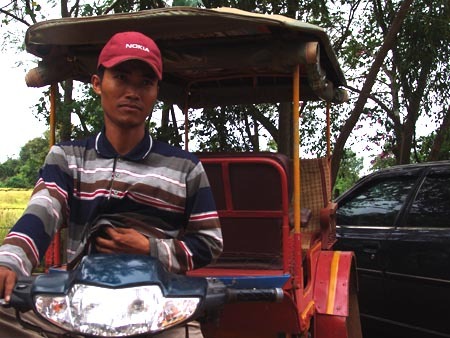 We arrived in Phnom Penh in the evening and were surrounded by about 15 men, all pulling us one way or another, grabbing our hands and yelling all sorts of things, trying to convince us to stay at their guesthouses. Finally I asked the two I was considering if they’d give us free beer and one of them said yes, so we chose him. 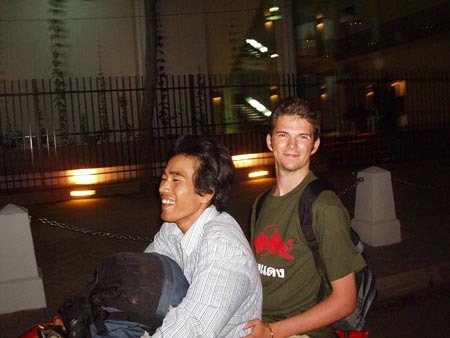 He took me on his motorbike, while Holly went on another motorbike and Ron and Joey went in a tuk-tuk with 3 of the bags. As you can see, my driver put my 25 kg bag in front of him. The next morning we arranged for a tuk-tuk to take the four of us around town for the day, to see a few sights. 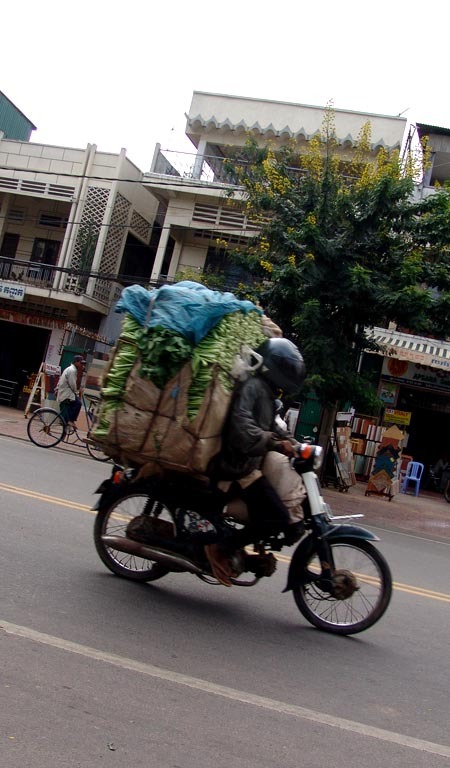 On our way I decided to take a pic of one of the many, many motorcycles carrying huge loads of produce around town. We saw stuff way crazier than this on people’s motorbikes, like a full-size mattress, a huge glass window, a fridge, and other assorted stuff that Canadians would need a pick-up to carry. 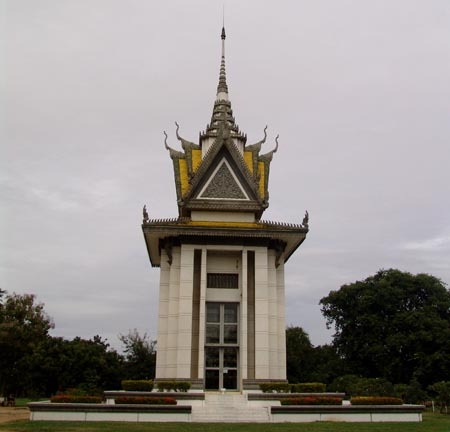 Our first stop was the Killing Fields. 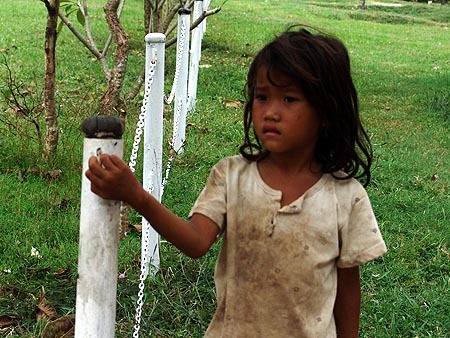 There are mass graves all around Cambodia, but one particularly large set of mass graves was right outside the city and has been turned into a memorial. 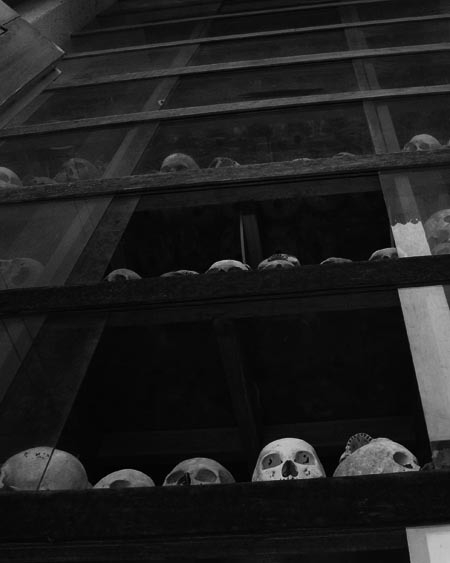 While that building above looks pleasant from a distance, it is full all the way to the top with the skulls and ragged clothes of victims of the Khmer Rouge regime, 1975-79, during which over 25% of Cambodians were murdered. 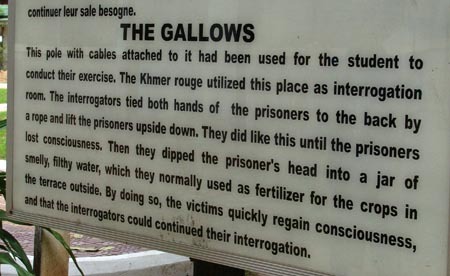 During the Khmer Rouge regime, anyone who had any education was killed, anyone who spoke a foreign language was killed, anyone who asked questions or made suggestions was killed, anyone who didn’t work from dawn to dusk was killed. Kids were turned against their parents, and thousands of people were brainwashed to follow the orders of the people at the top. 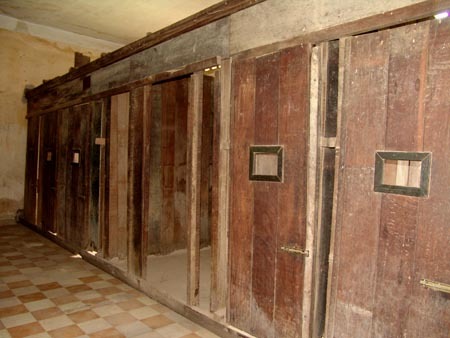 The cities were emptied to carry out the Khmer Rouge’s psychotic plans for an agrarian society with no urban people. 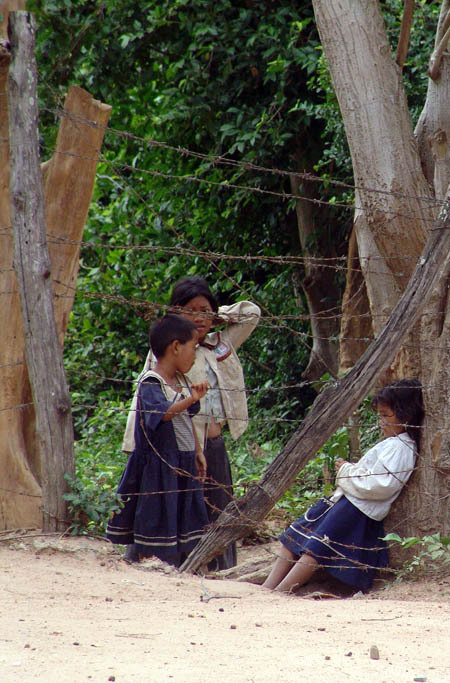 25 years later, the new generations don’t walk around dwelling on this sad history, but they have been put in a bad spot, as the murders of any educated Cambodians in the 70s means there was no one to set up the universities or run the country effectively when the Khmer Rouge were finally defeated. Only in the last 10 years has there been peace in Cambodia, but hopefully this will last and the newer generations will rebuild what was considered the most advanced country in Southeast Asia forty years ago. 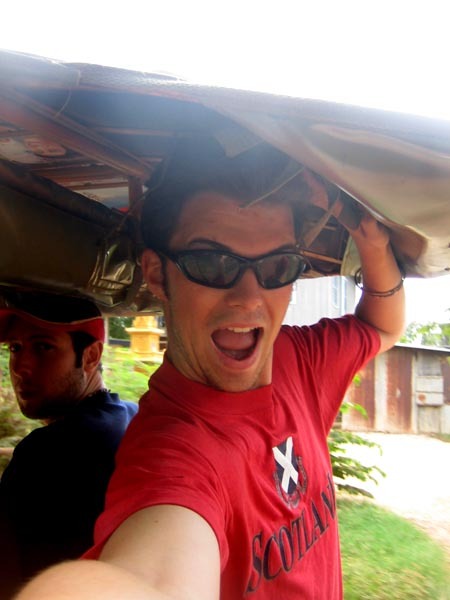 Our tuk-tuk driver was cool. Since there wasn’t really room for 4 people in the back, we took turns sitting on the bit of wood over the spot where the motorcycle is hitched to the cart. I had to borrow Ron’s sunglasses to keep the dust out of my eyes! 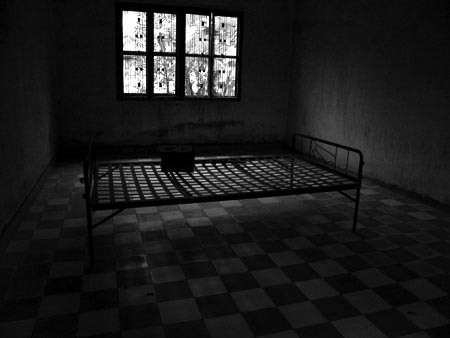 We then stopped at Tuol Sleng prison. 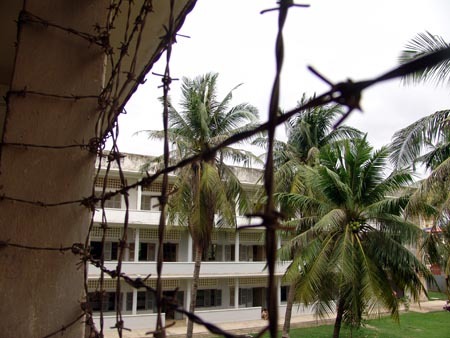 It had been a high school, but was turned into a prison/interrogation centre by the Khmer Rouge. 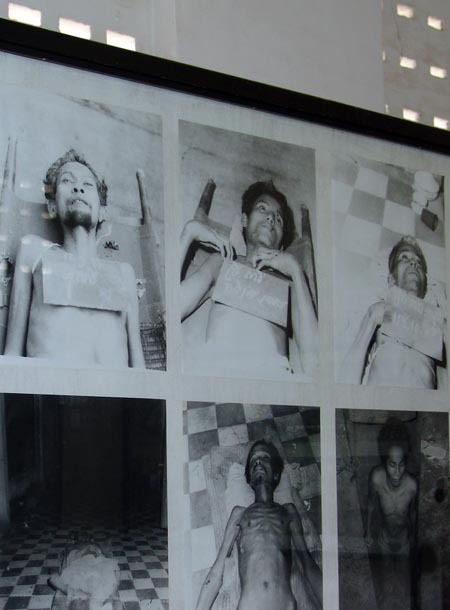 Out of 14,000 people to be sent to Tuol Sleng prison, less than a dozen ever survived. 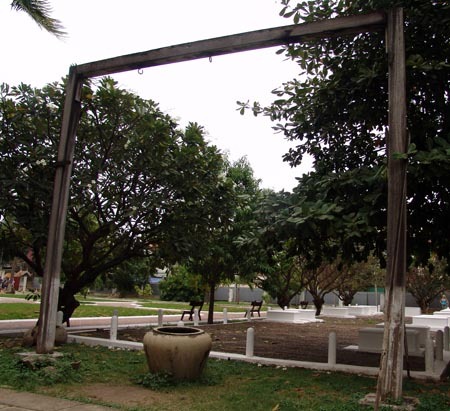 This next pic is quite boring… a normal piece of outdoor exercise equipment. To understand it, read the write-up that follows. 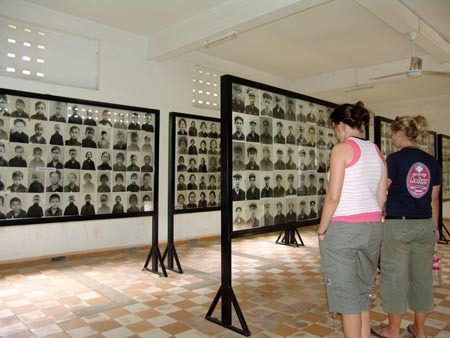 Photos, autobiographies and forced confessions of every prisoner held at Tuol Sleng were kept by the Khmer Rouge. 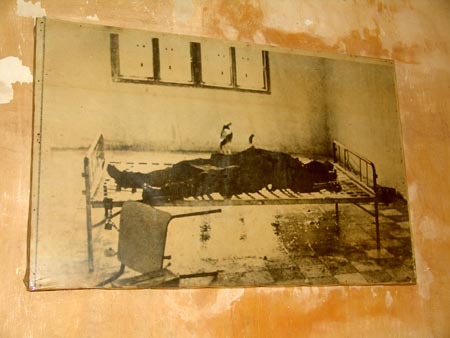 The prisoners were kept in small wood/brick cells installed in the high school classrooms, and were kept attached to leg irons all day and all night. There were no escapes whatsoever. Tired and with lots of stuff to think about, we spent a few minutes relaxing by the Mekong River then headed back to our guesthouse for the night.